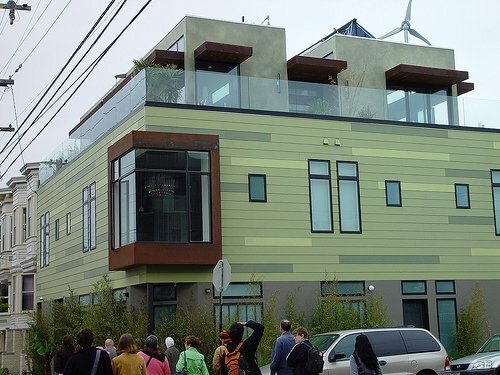 La Casa Verde, situated in San Francisco's Mission District, is built with sustainable materials and uses renewable sources of energy. This is one of the first homes in the U.S. to achieve certification through Leadership in Energy and Environmental Design ratings. Skystream wind turbine from Whirligig provides up to half of the home's energy. real-time, web-based monitoring system from Greater than Green displays energy use and generation as well as water use and data about the amounts of rainwater collected. Leadership in Energy and Environmental Design rating certified. greywater system used for garden irrigation, regulated according to local weather data and soil conditions. This page was last modified 13:58, 30 October 2008.